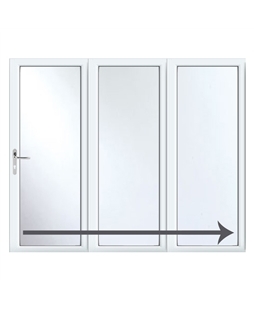 These French Doors come with a carbon fibre reinforced inner frame, providing solid fixings for all the lock components. 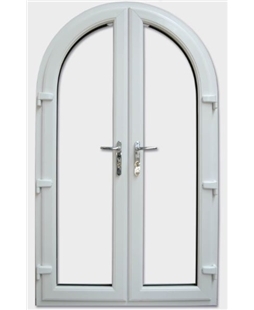 Approved by the Association of Chief Police Officers initiative 'Secured by Design' making these the most impenetrable French Doors on the market. Heat Shield technology prevents the doors from absorbing heat, improving performance. 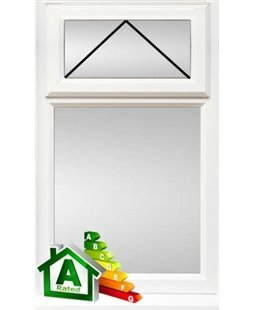 All of our uPVC, Patio, French and Stable Doors - as with our windows - are available in white, rosewood or light oak. Rosewood (the left hand side finish) is the new mahogany, while golden oak (on the right) offers a wonderful lighter option for your door. 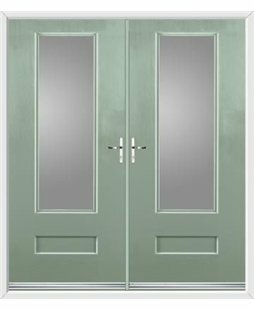 These finishes are available on both sides of your door, or just on the outside with white inside. Please add 25% to any price you see for either of these finishes. The Low Aluminium Threshold is only 29mm high on our uPVC doors and 14mm high on our Composite Door. A sill sits across the bottom of your door, under your threshold, and directs water away from your home. If your house requires a sill, it forms part of Building Regulations. Our doors come as standard with a lever/lever handle configuration; which means that you will need to use the key to lock or unlock your door, whether you are inside or outside. 1) With a Lever / Pad handle, you can get locked out of your house if you do not take your key when you step outside. 2) With a Lever / Pad handle you still need to push the handle up and turn the lock with your key for your door to be fully secure. If you only pull the door closed then it is only locked on the centre keep. They are available in white, chrome, gold and black. Our letter plates are sprung and are fitted with internal draft exclusion brushes. Knockers are available in white, chrome, gold and black. Spy holes are available in white, chrome, gold and black. Please note: If you would like to have your spyhole at a certain height, please inform our surveyor at time of order, and ensure the order form states either the height you wish it to be at or that the spyhole to be sent loose for the installer to fit at the time of installation. Spy holes in knockers are available in white, chrome, gold and black. Door chains are available chrome or gold. Numerals are available in chrome, gold and black. Very helpful staff, the installation was quick and professional. The doors were as we imagined they would be. Thank you.